What’s the Best Tool for the Task? Do my students have access to the tool when they leave my classroom? Can the technology support how students will have to turn in the assignment? Can the bandwidth support multiple uploads or will students turn in the project with a flash drive? Is the technology free and user-friendly? 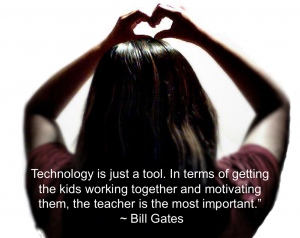 Does the technology support various learning styles? How long will my students need to learn how to use the tool and can I afford the time to teach them how to use the tool? Will I be able to embed? What are the privacy settings and can I adjust them to match my needs? Is the tool safe for students to explore aside from my guidance? Do students have to register or can I make them accounts? In addition to these questions, you can find various tools for different types of tasks by visiting the various sites below. I, also, recommend creating a digital sandbox for your learners so they can choose between a few of the tools you love! Edshelf- search engine for technology tools and mobile apps. Type in grade level, task, etc. Also, has teacher reviews. Ideas to Inspire- find various ways teachers have used a tool with their learners. These are collaborative Google Drive presentations from teachers worldwide titled, Interesting Ways, which was started by Tom Barrett. View the Interesting Ways presentations at Edte.ch. Kelly Tenkely has created various Digital Bloom illustrations that feature some of the best tools to support each level of Bloom’s Taxonomy. Find her collection here. Kathy Schrock also has a great Digital Bloom’s collection for Android, Chrome, and IOS devices.